The Rhondda Heritage Park based at the former Lewis Merthyr Colliery, Trehafod, South Wales, which closed as a working mine in 1983. Mining commenced in the Rhondda Valleys in the 1850's and at one time there are over 53 working collieries in an area only 16 miles long. It is considered to be the most intensely mined area in the world and probably one of the most densely populated at the time in 1851 it had a rural population of around 951 inhabitants but by 1924 it had reached a population of 169,000. Trehafod village, where the heritage park is located today, grew mainly as a result of the industrial revolution and the rich bituminous coal in the lower Rhondda and the accessibility of the Glamorgan Canal and purpose built tram roads, and this area saw rapid economic growth in the nineteenth century. At one time there were nearly as many shops in this village as in the nearby town of Porth and included a grocers, butcher, fruitier, a cobblers, coach builders, post office bakehouse, fish shops, undertakers, midwife, dentist as well as Company stores where miners could exchange goods for tokens. 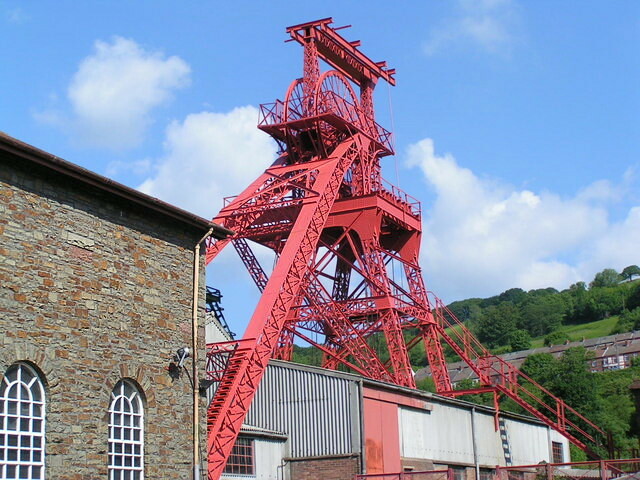 The Rhondda Heritage Park was established to try to bring back to life some of that mining history and to serve as a historical reminder for generations to come of the importance coal once had in the South Wales Valleys, both economically and socially. The Visitor Centre which houses Art Gallery, Restaurant, Gift Shop and a 1950's re-constructed Village Street. Admission to this area is free except on special event days. The Engery Zone is a large play area for children. The 1950's village street has 3 period shops and a cottage allowing you to explore both the domestic and commercial aspects of valley life over the past 150 years. This area also has a mural and exhibition showing the story of the Tynewydd mining disaster of 1877. 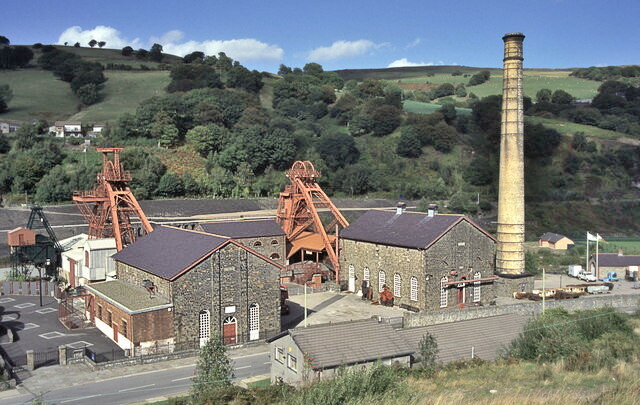 Bertie Winding House, which takes you back to the start of mining and tells the history of mining in the Rhondda Valleys particularly looking at the Lewis Merthyr Colliery, the Tynewydd mining disaster and takes a look at some of the important figures in South Wales coal mining. In the Lamp Room they prepare you for a shift down the safest pit in South Wales and look at the importance of safety lamps before collecting mining helmets and descending n the 'cage' to 'pit bottom'. Once underground you will get to see what life as a coalminer was like and by touching the machinery, hearing the effects of explosives detonating, and through smell and taste sample the changing atmospheric conditions and humidity of life underground. At the end of the tour you take a simulated ride which transports you back to the surface, during this experience you are hurtled and catapulted through the dark and twisting tunnels. At the Fan House a multi media exhibition explains the role of women in the community and the cultural and social heritage of the Valleys as well as tracing history to the end of coal mining in the Rhondda Valleys. The Trevor Winding House takes you back in time to 1958 where you take part in a working shift with the narrator Bryn Rees and get to see the winding engine in action. 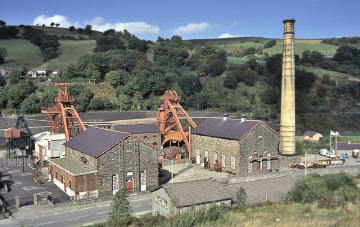 A visit to Rhondda Heritage Park requires 2 to 2.5 hours in order to take advantage of everything on offer. Shorter visits can however be accommodated. From junction 32 of the M4 follow the A470 to Pontypridd. 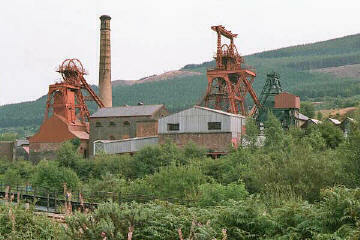 Rhondda Heritage Park is located between Pontypridd and Porth. wear warm clothing and suitable footwear for underground tour. Open daily 10am - 6pm (last tour 4pm). Closed from Dec 25th to Jan 2nd inclusive, and Oct - Easter closed Mondays. Special Needs Access: Incline to visitor centre entrance. Lift for upstairs facilities. Disabled toilet on ground floor. For underground tour restricted to 4 wheelchairs per tour. No access to simulated ride. Special Needs Facilities: Reserved car parking, unisex toilets, ramps and lifts to first floor. Assisted access for wheelchairs even underground.